A surprising number of migrants have found work as the German economy prospers, new statistics show. But studies have also found that non-EU migrants continue to make up a disproportionate number of welfare recipients. The news out of Germany's Federal Employment Agency is good. The agency's Institute for Employment Research (IAB) reports that the economy is on course to create 650,000 new jobs this year, 100,000 of which will be taken up by people who came to the country as refugees. Overall, just under 46 million people are expected to be employed in 2018 — a record number for postwar Germany. Long-term unemployed people are also increasingly finding their way back into the workforce, and the number of job vacancies is reaching a record high. The number of unemployed people is projected to sink to 2.3 million — the lowest it has been since German reunification in 1990. "It will take time to convert the additional potential of refugees into significant actual employment," the authors of the IAB report wrote. "But investments in education and language abilities promise major fiscal and macroeconomic advantages in the long term." Far from being a drag on the German economy, the IAB contends, refugees who fled conflict in countries such as Syria, Iraq and Afghanistan have been a positive force. "Generally speaking, the high increases in employment we've had in the past few years in Germany would not have been possible without immigration," Enzo Weber, who heads the IAB's macroeconomic research department, said in a statement. "The demographic trend is pointing clearly downward, and it was only possible to compensate for this with immigration and rising employment." The IAB also reports that more migrants could receive jobs if procedures for acknowledging the diplomas and other qualifications they achieved in their home countries are streamlined. In another piece of good news, the IAB reports that the jobs Germany is creating are quality ones. Weber said the rise in employment applied only to full work relationships in which employers and employees pay into the social welfare system. By contrast, the numbers of low-paid "minijobs" exempt from social welfare is expected to stagnate. Earlier this year, the IAB concluded that refugee employment had risen 60 percent, although the level of unemployment in November 2017 still remained about 43 percent. The IAB also rejects the idea that the number of migrants in the labor market will drives wages down. "Migration shocks to Germany show no significant effects on the unemployment rate, GDP per capita and the wage share," Weber and co-author Sabine Klinger wrote in a separate study. "This implies that immigration increased the volume of the economy according to the average performance of the overall labor force." The IAB concedes, however, that the jury is still out on the overall economic effect of recently arrived refugees as most are not yet integrated into the labor market. "While it cannot be excluded that the refugee wave since 2015 will have negative wage effects in Germany," Weber and Klinger concluded, "it seems very unlikely that these already appeared over the recent years." The true picture of migrant employment in Germany is difficult to ascertain because job statistics are recorded on the basis of nationality and not refugee or other status. The same applies to statistics on how many people draw Germany's minimum welfare support, Hartz IV. But new government data suggest that the number of asylum recipients who are on Hartz IV may have increased even as more and more refugees are finding jobs. 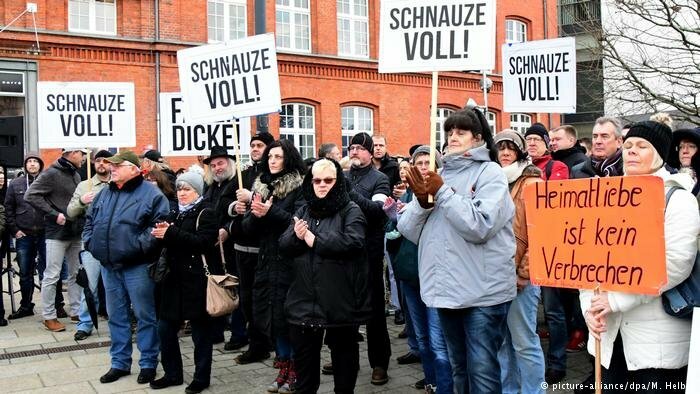 In response to an official request for information made by the anti-immigrant right-wing Alternative for Germany (AfD) party, the government reported that about 1.6 million of the 5.9 million Hartz IV recipients from November 2016 to October 2017 were non-EU migrants. That figure was up from 1.36 million in the previous 12-month period. Small- to medium-size cities in particular have complained about being unable to accommodate the numbers of refugees they are asked to take in. In recent months places from Cottbus (population 100,000) and Freiberg (41,600) in eastern Germany to Salzgitter (103,000) and Delmenhorst (77,000) in the west have successfully petitioned their federal states to prevent more refugees from being sent there. All four of those cities are governed not by the AfD, but by mayors from Germany's two largest political parties: the Christian Democrats and the Social Democrats.